The illustration depicts a wild type mouse and a littermate mutant mouse expressing a constitutive serine phosphorylation mutation in Fas-Associated Death Domain (FADD-D). FADD-D mice exhibit reduced body size. The corresponding confocal images show mislocalization of FADD-D protein. 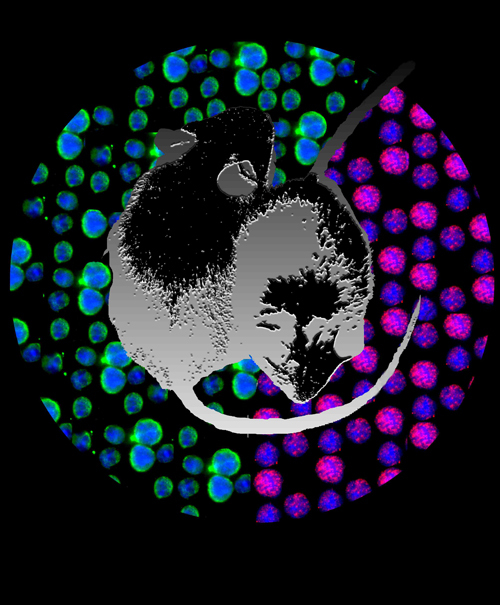 Activated T cells from either wild type or FADD-D mice were stained with FADD antibody (green and pink, respectively) and DAPI (blue).